• Hammock size: 110" x 57"
Purchased as a gift for friend. Exactly what he wanted but he hasn't opened the box yet to put it together & use it. He is taking it to his new home in Phoenix, AZ. Great product and the shipping was incredibly fast. This item is a Christmas gift for my son-in-law and I'm very sure he is going to like it. I have one and have had it for quite some time and enjoy it very much. I was very happy with my order, it was a good experience. The product was just as great as in the picture and the description. I would defiantly recommend it to everyone. 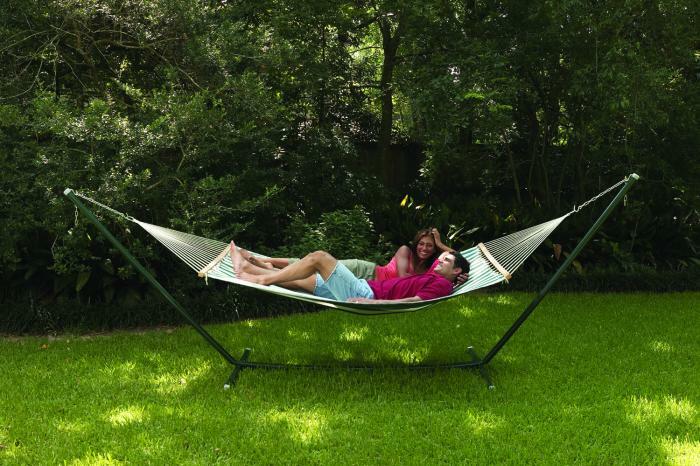 This hammock was a great bargain, very sturdy and large enough to hold 2 people comfortably. We even had 4 people sitting in the hammock one night. It is the hit of the cookouts this summer. We absolutely would recommend this to everyone. It arrived very quickly and was easy to assemble. Great hammock and great stand. It has more than lived up to my expectations. I am very happy with this hammock and stand set. It is a great value. Great price and fantastic quality. Easy to assemble. Great product and the service I received with a glitch in the order was great. I will recommend it. Nothing better than cuddling with your mate on a comfortable "and plenty of room for two" hammock. The product arrived quickly and in perfect shape. In less than a half hour we were swaying in the breeze, enjoying life. I gave it as a gift and it was well liked.